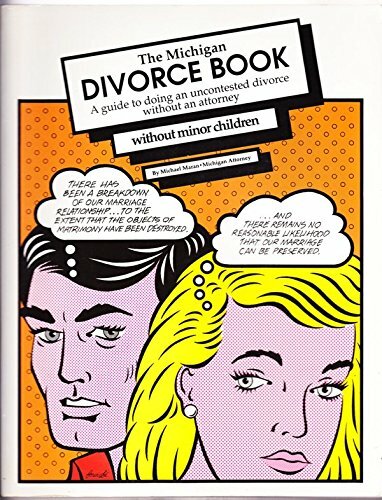 With Alan Bloomfield | 10th edition from Thunder Bay Pr (March 3, 2016); titled "The Michigan Divorce Book: A Guide to Doing an Uncontested Divorce Without an Attorney Without Minor Children"
About: Now there's a low-cost divorce alternative â The Michigan Divorce Book. 9 edition from Grand River Pr (May 20, 2013); titled "The Michigan Divorce Book: A Guide to Doing an Uncontested Divorce Without an Attorney Without Minor Children"
About: A guide to doing an uncontested divorce in Michigan without an attorney, with complete forms and instructions. 8 edition from Grand River Pr (January 1, 2009); titled "The Michigan Divorce Book: A Guide to Doing an Uncontested Divorce Without an Attorney Without Minor Children"
About: Used by thousands of divorce-filers during the last 25 years, The Michigan Divorce Books have all you need to do an uncontested divorce in Michigan without an attorney. from Grand River Pr (March 1, 2007); titled "The Michigan Divorce Book: A Guide to Doing an Uncontested Divorce Without an Attorney Without Minor Children"
About: Complete information, instructions, sample forms and blank tear-out forms for doing an uncontested divorce in Michigan without an attorney.